I often get asked how to do casual wear without looking scruffy or like you have made no effort. It’s a tricky balance because typically the time you want a casual outfit is when you are at home. If no-one is going to see you, you might think it doesn’t matter. But how often has someone turned up unannounced or have you needed to run out to the shops. At the Autumn Update event last week, a couple of ladies brought this up, saying they never know what to wear for really casual days. When we are shopping for pieces for our wardrobe we probably don’t think about those casual days. But, if like me you work at home most of the time, they do take up a considerable amount of your days. So I think it’s worth figuring out how much of your time you need these kind of outfits and then using a proportionate amount of your budget towards these clothes. Buying a cheap pair of leggings because no one is going to see them is a false economy. How many times will they wash and wear before falling apart of becoming revealingly thin? Buying a great quality pair, that will was and last for more than one season and still look good on those occasions you are seen wearing them, will work out better value in the long run. I have a few favourite places to look for this kind of good quality casual wear. My four top options are; Boden, because they do a great range of colours, Hush, who specialise in great casual pieces are reasonable prices, Baukjen, again great with casuals and quality and ME+EM, a little more pricey but sizing tends to be generous and you get what you have paid for in quality. 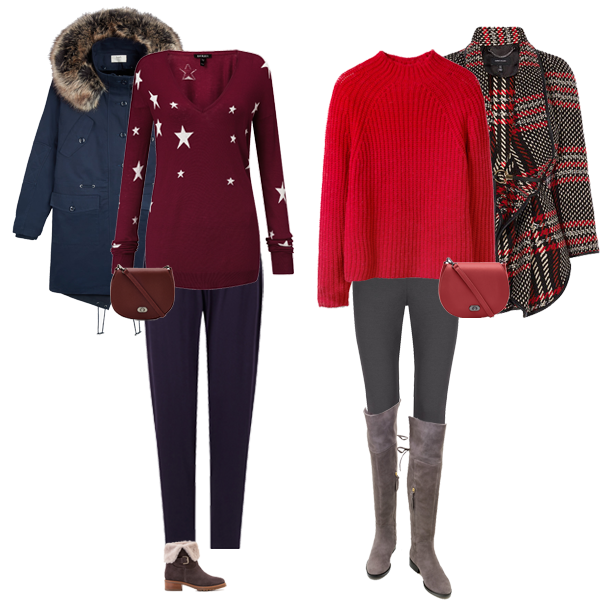 Below are a few outfit ideas, with carefully chosen pieces that you can accessorise if you need to go out. For the first two looks I have chosen Palazzo trousers from ME+EM. On the left a pair of the classic Palazzos in Olive. I teamed these with a spot print top that makes it a little more interesting than a plain T and added an oversize cardigan (oversize knits are very on trend this season, this one comes in grey too) which you can wrap around yourself to stay cosy. 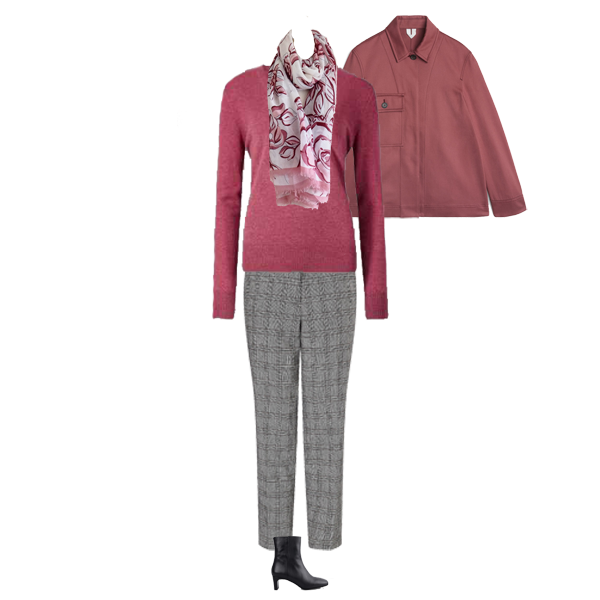 If you have to head out, throw on a scarf and a pair of metallic trainers to give the outfit some extra polish. On the right I’ve used ME+EM’s signature side stripe Palazzos (they have lots of side stripe styles in casual and more tailored trousers) with these I have added a cosy pink knit. Again if you need to dress them up a bit add a scarf and trainers. For the next outfit I have chosen two different pair of trousers, both of which I have put in numerous clients’ wardrobes. 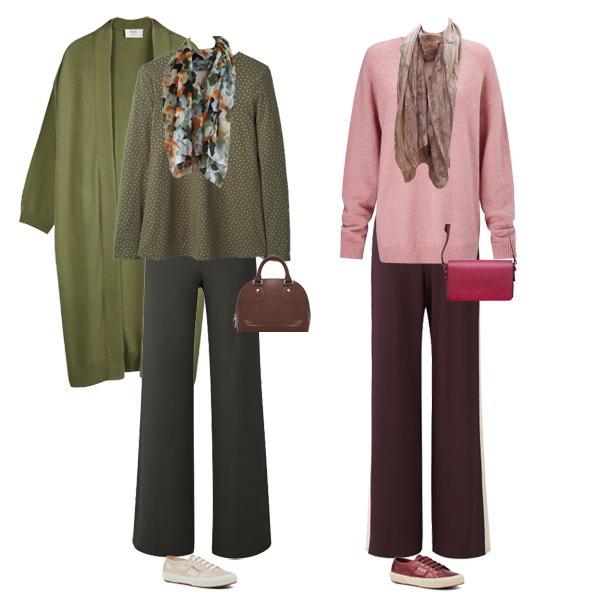 Firstly the Neath trousers from Baukjen (currently reduced) They are a great quality jersey trouser with an elasticated waist – something I always want when I am sitting at my desk for long hours. Jeans just aren’t a comfortable option for me. With these I have added one of their longer line star print sweater. If you need to head out into the cold, add a cosy Parka and shearling lined boots. On the right, the second pair is the Winser Miracle Leggings. Oh how I love these! Thick enough not to bag, fitted enough to smooth out any lumps and bumps but still stretchy enough for supreme comfort all day. I wear mine (and I have 3 colours – see how I wear them here) with a longer length sweater and then if I go out I tuck them into a pair of boots as I’ve shown them here. I’ve really smartened these up with a tartan belted cause to create an outfit I would be happy to wear out for a shopping trip. If you struggle with how to do casual wear and would like help in creating a casual capsule wardrobe, why not order my six item personalised capsule wardrobe and I will find the pieces for you, to suit your colouring, shape and budget.